Hand made, organic, luxury granola maker Upfull Food returns to PrimeStox. 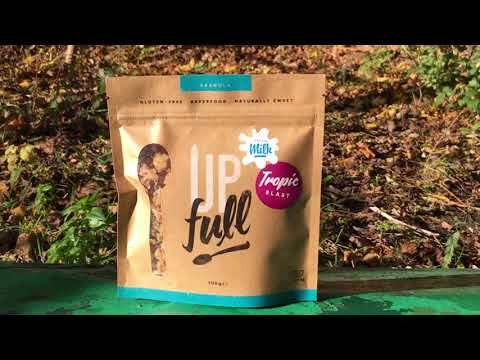 After a successful first offer on PrimeStox, Upfull Food is back. Upfull Food is a maker of hand-made, organic, luxury granolas. They successfully launched their innovative 'Bags on the Go' in 2017, selling to 85 outlets nationwide. Now Upfull are upscaling in response to a new contract and a significant increase in demand. The company will buy baking equipment to supply larger orders as well as packaging and raw materials. You can fund them here and earn 11.9% in 8 months. You'll also become a Friend of the brand. Upfull Food Expansion successfully raised £25,000 to fund the production of 20,000 bags 341 days ago. Check back soon for more offers. Founder Terence Lapidus brought Upfull's first offer to PrimeStox last November and it was successful. The funds were repaid in full and a day early. Upfull was also selected to provide breakfast at the popular 2018 Wilderness Festival. Terence was inspired to create Upfull based on his love of healthy granola and to create a food phenomenon filed with positive action and positive thought. 'Upfull' means positivity in Jamaican slang. Upfull's head office is in Lisson Wide boating community near Regents Park. Their production facilites are in London. Upfull's Head of Operations is ex-Gordon Ramsay chef Paul Cromie. This April Upfull successfully concluded a deal to supply an important distributor with their granola. The buyer is Vegetarian Express who are major suppliers to the UK catering industry. They will be taking bags of granola and bulk deliveries and selling Upfull product to up to 100 establishments nationwide. This includes Virgin Active gyms, hospitals, several London museums and football clubs. In total over the next 6 months Upfull expects to earn £10,000 to £18,000 per month of revenue under this contract. To fulfill the new demand Upfull is now expanding. It is raising £25,000 to pay for its expansion. The funds raised will pay for a high capacity food mixer which can mix 40kg a time. It will also buy a three layer electric oven with a conveyor belt that can produce 120kg of toasted granola per hour. The company will also purchase raw materials and packaging in sufficient quantity to achieve meaningful cost savings. Upfull will also be diversifying beyond its signature 'Bags on the Go'. Terence has plans to include larger 400g Boxes in its product range. This will enable it to sell into larger supermarkets and via direct mail. The boxes are expected to become available by July 2018 and will be available in all four flavours. Final design is taking place. Today Upfull is raising £25,000. Each £25.00 invested will be backed by 20 bags of delicious hand made granola. In return Upfull is offering to repay in 8 months plus a profit of 11.9%.